When three-digit summer days make me feel too hot to eat, that is one hot day and a miserable me. I don’t like to be hot. The last few days have been that kind of hot, so a cool pudding craving came over me one day. Looking in my stash of pudding boxes, I found a sugar-free vanilla one. Sounded good to me. Mixing it with two cups of 2% milk and at least three serving spoonfuls of Cool Whip, I was ready to sit down and enjoy a cool summer day dessert. The dessert I ate actually consisted of a big helping of the pudding, a handful of blueberries, two or three strawberries, sliced – and a slice of angel food cake. For all of you to-the-book clean-eating nutritionists, it’s not 100% sugar-free. Neither is it gluten free. What it is is a yummy dessert that tastes incredibly good on a miserably hot day. You can, however, change it up to be all that you want it to be. Leave off the cake and Cool Whip if you must when adapting this dessert (don’t know why anyone would not want to have some of that Cool Whip, though). A good alternative to the Cool Whip is real whipping cream. Another alternative is to make your own angel food cake. The nice thing about it is that it’s easy to come up with a quick and delightful dessert with fresh strawberries and blueberries, just in time for a pretty red, white, and blue July 4th dessert. Speaking of blueberries, have you purchased any lately that went bad way too fast? As soon as I get them home and in the frig, they start getting that moldy white look. About a week ago nearly a whole batch went bad like that. This time I was prepared. Throwing away a few (they went in my compost pile at least), I put the rest in the freezer. The frozen blueberries will be good in nutritious smoothies or pancakes made with mesquite powder that I’m ordering today. Can’t wait! I heard an ethnobotanist say not long ago he puts the powder in his oatmeal, pancakes, and even cookies. I’ve made flourless pancakes made with bananas. The only drawback to that is a banana does have a lot of sugar, natural or not. The banana pancakes tasted good, although they were quite flat. So I’m excited to try the mesquite flour pancakes. If you try this, be sure to replace 1/4 of the regular flour you use with the mesquite flour. When my mesquite flour comes in, I want to use it to try a homemade biscuit-like Strawberry Shortcake. What do you think? Do you have a Shortcake recipe you like? Share it in my comment section. I love to hear from my readers! Let’s go over to Miz Helen’s Full Plate Thursday to see what’s going to be cookin’ for July 4th! Slice the amount of cake servings desired. Top each slice with a serving spoon-size of pudding and a dollop of Cool Whip. Add strawberries and blueberries on top. 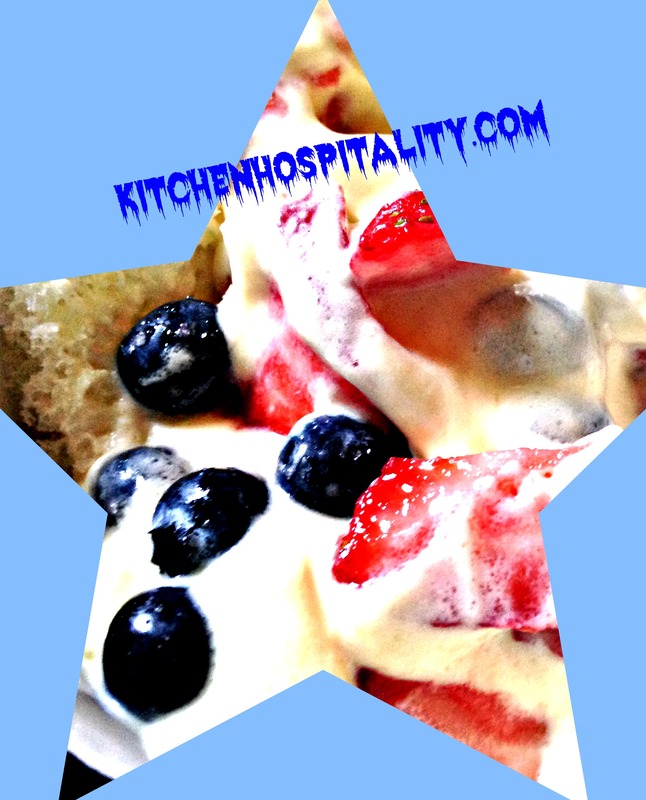 This is an easy and light dessert to make and to bring to a July 4th potluck. Often at gatherings there are sugar-loaded desserts, so guests who are careful with sugar and calorie intake will appreciate the light dessert.